"...the subliminal impact of all Benjamin's attention to various tiny details makes this Treemonisha feel instinctively right.... 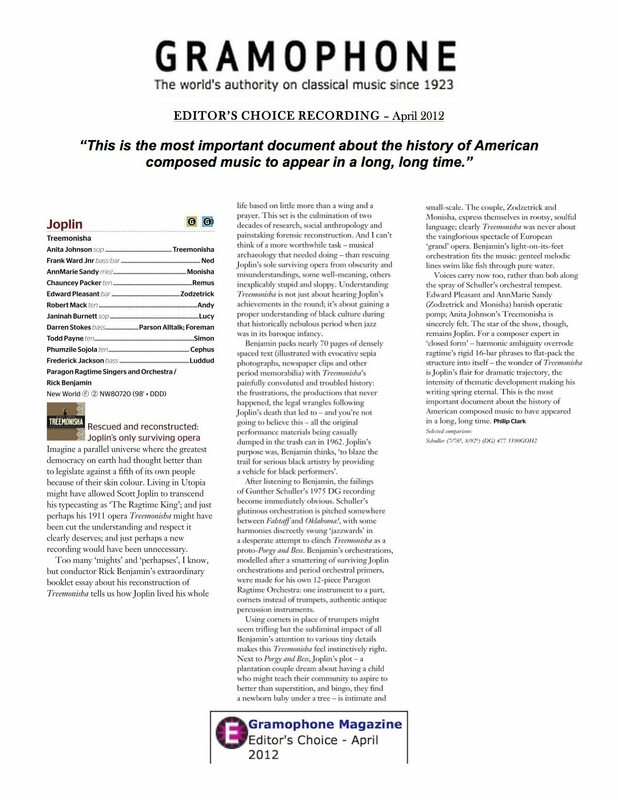 This [recording] is the most important document about the history of American composed music to have appeared in a long, long time." "...conductor and scholar Rick Benjamin, reknowned for the 'archeology' and recreation of American music...."
"Rick has often been compared to André Rieu, an equally dedicated champion of music's lighter or sentimental side." "And as I listen, buoyed to the rafters...I realize the significance of Mr. Benjamin's role in protecting an important American treasure. The result will not just be a pleasure to hear but for many a true revelation." "...a musician of wit and sensibility." "...a vigorous and utterly charming performance...superbly led by conductor Rick Benjamin." "...sweetly foursquare arias alternate with choruses that could make you weep with joy. There is nothing else like it, and Benjamin, aided by his excellent orchestra and singers, has finally made it whole." "Benjamin's recording - the first to emerge since Gunther Schuller's Houston Grand Opera version - is perfectly balanced to get the best out of the score....Benjamin's new orchestration and the PRO's punch are prize-worthy." "The performance is both inspired and inspiring. Benjamin's instincts for every number are correct; he presents each in the right tempo and mood, and with the right accompaniment.... A major, delighful release." "Benjamin also conducts with a sure instinct for style and color.... Benjamin's satisfying approach is especially rewarding in the instrumental introduction to Act III...but he has also found the color for each number in the score.... It is a mark of Benjamin's skill that this evocative performance doesn't make the music sound false." 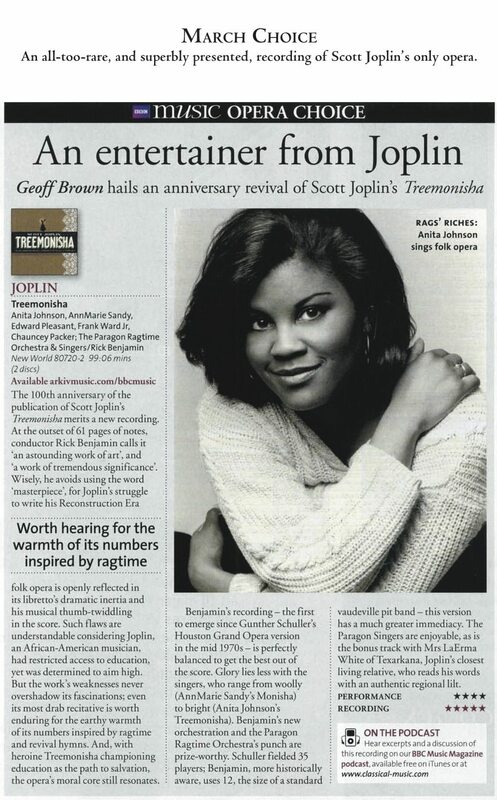 "The first thing listeners to this splendid new 'Treemonisha' will note is its intimacy.... 'Treemonisha,' says Mr. Benjamin, 'is truly a rare artifact of a vanished culture: an opera about African-Americans of the Reconstruction era—created by a black man who actually lived through it...."
"...a tireless and indefatigable champion of the music of America at turn of the century -- the 20th century."